In one of my previous post, i shared with you, the meaning of rooting, why you need to root your phone and how to root any Android Phone. If you own an Android phone or tab, you can easily check if it has been rooted or not. Today i have an interesting post that will teach you how to check if you have successful root your Android or Tab phone. This app checks if your phone has root access. You can see information about: device and Android version, Superuser, BusyBox and Environment variables. It will check and verify the Su binary located on your device. Check User and Group Id. The test confirms proper permissions and flags on the Su binary. How can I check if my Android Phone or Tab is Rooted??? 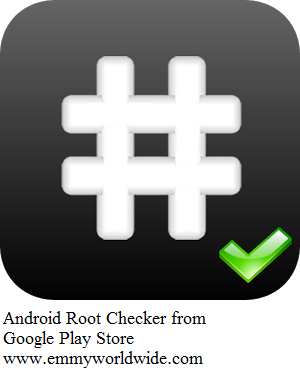 To get a root checker app to your device (Android phone or Tab), all you just need to do is to download root checker app to your device (Android phone or Tab), install, launch it and tap the “check root” button. You can download the root checker from Play store here or just type "Root Checker" on your Google Play Store search box. Then, it means you should root your phone. Read : why you need to root your phone and how to root any Android Phone. Do you like this post and did it worked for you? If Yes, kindly drop me a comment through the comment box. Related Posts: Android Tips, How to, Smartphone tips, Unlocking tips. Labels: Android Tips, How to, Smartphone tips, Unlocking tips.